By Jim Dower: Oleksander Usyk might not move up to heavyweight in his next fight as fans have thought he would. Usyk’s manager Egis Klimas says they may take one more fight at cruiserweight against possibly Andre Ward before they make the move up to heavyweight to work towards a title shot against IBF/WBA/WBO champion Anthony Joshua, according to ESPN. If Ward can beat Usyk in a huge upset, he could set himself up for a career high payday fight against Anthony Joshua. The money Ward can make facing Joshua would be a nice retirement package for the Oakland, California native. Usyk defeated former WBC cruiserweight champion Tony Bellew (30-3-1, 20 KOs) by an 8th round knockout earlier this month on November 10 in Manchester, England. Bellew had talked of wanting to face Ward (32-0, 16 KOs), but with him losing to Usyk, that option is no longer realistic. Klimas feels that Usyk should be the one that now possibly faces Ward if he’s interested in coming out of retirement to take the fight. “Some people talk about maybe Andre Ward is going to come back because Andre Ward said that he wants to fight Bellew, but Bellew didn’t beat Usyk. So right now is he considering to come back and fight Usyk?” Klimas said to ESPN.com. 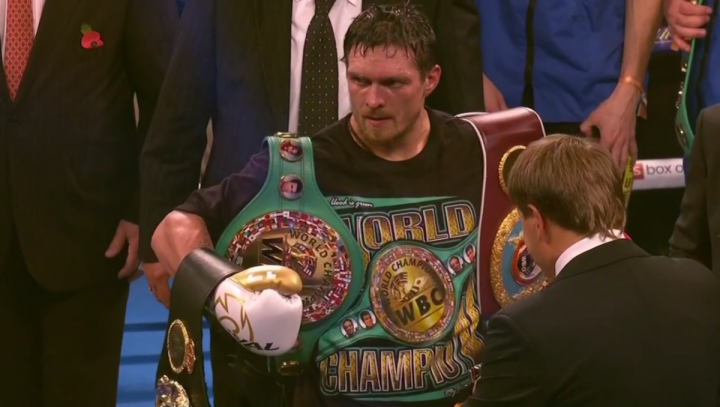 Usyk vs. Ward would be a good fight at cruiserweight, but it won’t be easy to put together. Ward, 34, will want a good percentage split of the revenue for a fight that could hurt his legacy. The unbeaten Ward has wins over Mikkel Kessler, Carl Froch, Sergey Kovalev, Chad Dawson, Arthur Abraham, Sullivan Barrera and Sakio Bika. Those are the best names on Ward’s 13-year pro resume. Ward never faced Adonis Stevenson, Dmitry Bivol or Artur Beterbiev at light heavyweight. Some boxing fans think Ward retire from boxing in order to avoid facing Beterbiev and Bivol. Moving up to cruiserweight to take on the unbeaten Usyk will take a lot of courage for Ward, seeing as he could lose for the first time. On size alone, Ward, 6’0″, could have issues with the 6’3″ Usyk’s height and reach advantage. In his prime, Ward had good mobility, but not anymore. Ward is more of a flat-footed fighter at this point in his career. When Ward does move, he does it in slow circles. Klimas plans on putting Usyk in with two heavyweight tune-up matches before matching him against Joshua for a world title shot. With Usyk co-promoted by Matchroom Sport promoter Eddie Hearn, there will be no problems setting up the Joshua-Usyk fight. The fight will be made straightaway after Usyk takes his 2 tune-up fights. Hearn will obviously offer Usyk to fight his Matchroom heavyweights in Dillian Whyte, Dereck Chisora, Jarrell Miller or Dave Allen to help him get ready for the Joshua bout. Usyk will make the final decision whether he wants to take risky fights against top contenders before facing Joshua.